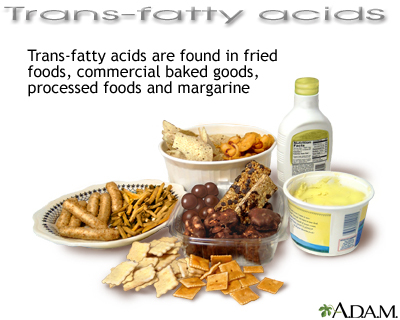 Trans fat is a type of dietary fat. Of all the fats, trans fat is the worst for your health. Too much trans fat in your diet increases your risk for heart disease and other health problems. Animal foods, such as red meats and dairy, have small amounts of trans fats. But most trans fats come from processed foods. Your body does not need or benefit from trans fats. Eating these fats increase your risk for health problems. Trans fats raise your LDL (bad) cholesterol. They also lower your HDL (good) cholesterol. High LDL along with low HDL levels can cause cholesterol to build up in your arteries (blood vessels). This increases your risk for heart disease and stroke. Many high-fat foods such as baked goods and fried foods have a lot of trans fat. Eating too much trans fat can cause you to gain weight. It may also increase your risk for type 2 diabetes. Staying at a healthy weight can reduce your risk for diabetes, heart disease, and other health problems. Your body does not need trans fat. So you should eat as little as possible. You should get no more than 25% to 30% of your daily calories from fats. You should limit saturated fat to less than 10% of your daily calories. You should limit trans fat to less than 1% of your daily calories. For someone with a 2,000 calorie a day diet, this is about 20 calories or 2 grams per day. All packaged foods have a nutrition label that includes fat content. Food makers are required to label trans fats on nutrition and some supplement labels. Reading food labels can help you keep track of how much trans fat you eat. Check the total fat in 1 serving. Look closely at the amount of trans fat in a serving. Look for the words "partially hydrogenated" in the ingredient list. It means oils have been turned to solids and trans fats. Manufacturers can show 0 grams of trans fat if there is less than 5 grams per serving, often a small serving size shows 0 grams of trans fat, but it still might be in there. If there are multiple servings in a package, then the whole package may contain several grams of trans fat. When tracking trans fat, make sure you count the number of servings you eat in 1 sitting. Many fast food restaurants use solid oils with trans fat for frying. Often they provide nutrition information on their menus. If you DO NOT see it posted, ask your server. You also may be able to find it on the restaurant's website. Not all packaged foods have trans fats. It depends on the ingredients that were used. That is why it is important to read labels. While it is fine to treat yourself to sweets and other high-fat foods once in a while, it is best to avoid food with trans fats completely. Use safflower or olive oil instead of butter and other solid fats. Switch from solid margarine to soft margarine. Ask what type of fats foods are cooked in when you eat out at restaurants. Avoid fried, packaged, and processed foods. Replace whole-fat diary with low-fat or nonfat milk, yogurt, and cheese. Kuehn BM. FDA moves to further reduce trans fat in food. JAMA. 2013;310(22):2386. PMID: 24327023 www.ncbi.nlm.nih.gov/pubmed/24327023. US Department of Health and Human Services, Food and Drug Administration. Trans fat. www.fda.gov/food/populartopics/ucm292278.htm. Updated May 18, 2018. Accessed July 13, 2018. Trans-fatty acids are manufactured fats created during a process called hydrogenation, which is aimed at stabilizing polyunsaturated oils to prevent them from becoming rancid and to keep them solid at room temperature. They may be particularly dangerous for heart health and may pose a risk for certain cancers. Hydrogenated fats are used in stick margarine, fast foods, commercial baked goods (donuts, cookies, crackers), and fried foods.